Astonished animal rescue officials who set a trap to catch an office thief stealing petty cash discovered the culprit was a real life cat burglar. 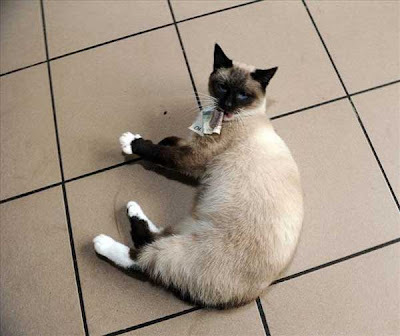 A secret camera set up to watch a pile of banknotes left on a desk recorded pedigree Burmese puss Klemens making off with the loot and stashing it under a sofa. Shelter manager Alina Celniak, from Swinoujscie, Poland, explained: "Money had been going missing for weeks and the atmosphere became very tense because we were convinced a member of staff had been taking it. We were amazed when we found out the truth," she added. After £200 had gone missing in a month, managers set up the secret camera and left banknotes on the desk to see who would be tempted The film showed two-year-old Klemens - one of the centre's rescue cats - sneaking into the office at midnight and making straight for the cash. "When we watched the video we saw Klemens jump up on the desk and pick up the money in her mouth," said Alina. "After rolling around on the floor with it she took it to one of the sofas and hid it underneath. When we went to look we found all the missing money hidden there too. We knew she liked to run off with pens and rulers, and things, but we never suspected she would steal money," she added.